Whether you most value cutting speed, weight or clean emissions, there’s a StrikeMaster power auger perfect for your ice-fishing needs. That includes different augers suited to different ice-fishing styles. We polled fishing guides, ICE FORCE pro-staffers and recreational anglers just like you, seeking advice on the best power augers for specific ice-fishing applications. Their recommendations follow. Ice anglers that fish predominantly in permanent, hard-sided icehouses will love StrikeMaster’s 4-stroke Honda 35cc Lite [Product 'Honda%2035cc%20Lite' not found!]. For starters, it’s quiet and won’t fill your shack with smoke when drill your holes. “The Honda Lite is a great auger for inside a big ice house, because the four-stroke doesn’t give off a lot of exhaust,” says Martin, who has run StrikeMaster augers for more than 20 years in his Ice Fishing Vacation School in Michigan’s Upper Peninsula. Jason Revermann, a recreational angler from New Munich, Minn, recalls the first time he drilled six holes with the 4-stroke Honda 35cc Lite in a wheel house. “It burned so clean there was no odor in the house when I was done,” he reports. “I love everything I own not smelling [after drilling],” adds Jake Bohnsack, a fishing guide based in Montrose, Minn.
Another plus for wheelhouse anglers? The Honda 35 cc Lite is the only 4-stroke power auger you can run with a 10-inch drill. Not only does a 10-inch hole better accommodate lunker fish, it allows for more time fishing and less time drilling. “Guys that fish in hard-side houses want bigger holes, so it takes longer for them to ice back up,” explains ICE FORCE Pro-Staffer James Holst, host of In-Depth Outdoors TV on Fox Sports North. For anglers that primarily run and gun, punching dozens of holes like famed “ice troller” Tony Roach, StrikeMaster’s Solo-powered augers fit the bill. Both the Lazer-Mag [Product 'Lazer%20Mag' not found!] and Lazer Pro [Product 'Lazer%20Pro' not found!] feature German-engineered Solo engines. The Lazer Pro is a little faster, as it comes with a 54 cc, 3-horsepower motor. The Lazer Mag runs on a 42 cc, 2.5-hp motor. For an angler on the move like Roach, power and cutting speed are not the only important considerations. Weight is important too. That’s why StrikeMaster augers are made lighter than their major competitors, often by a significant amount. Fit with 8-inch drills, both the Lazer Mag and Lazer Pro weigh only 26 pounds. This allows anglers to punch more holes, with less effort, while searching for that next hot school. twin, stainless steel Lazer blades made by Mora ICE of Sweden. No blades are sharper or cut as fast. Because he both runs and guns and fishes in a shelter, Nelson favors StrikeMaster’s 4-stroke Honda 35 cc Lite. “It’s quiet and relatively low-smoke, but more importantly for my kind of fishing, its shaver blade system drills holes without costing you too much in performance,” he says. It’s light too. Fit with an 8-inch drill, the Honda 35 cc Lite weighs only 23 pounds. The 10-inch version weighs 26 pounds, making it the lightest 10-inch auger in the world. Revermann also likes the Honda Lite for both fishing in a shelter and running and gunning. Kevin Sack, a recreational angler from Fargo, N.D. has enjoyed similar experiences. In one week last January, he drilled 200-300 holes with a StrikeMaster Honda 35cc Lite in sub-zero conditions. 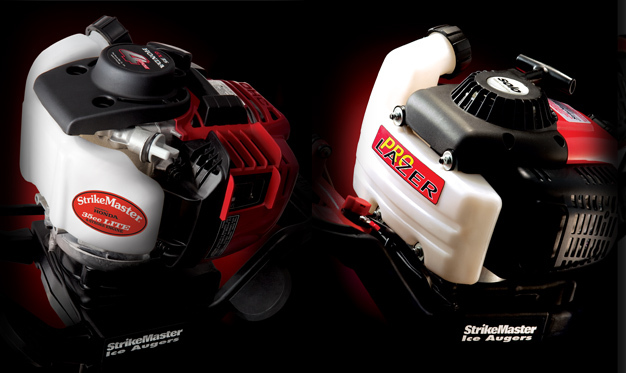 Not only do StrikeMaster Honda 35cc Lite augers burn clean, they also burn less fuel. In one weekend last winter, Bohnsack reports, he punched 38 holes with his Honda Lite on less than a half of tank of gas. “Crazy!” he says. Both performance and weight are concerns for ICE FORCE Pro-Staffer Dave Koonce, who drills “countless holes per outing” on his home ice on the Mississippi River backwaters near Prairie du Chien, Wis.
“The Solo is a fantastic machine, but for this old dawg, I will take the lighter 4-stroke Honda!” says Koonce. He likes that he doesn’t have to sacrifice performance for weight. Not only is StrikeMaster’s Honda auger fast and light, it’s reliable even in the coldest of weather. Bohnsack has run his Honda Lite with no problems in temps as low as 20 degrees below zero, he says. Koonce sings a similar tune. “I don’t have any issues with mine,” he says. Not even when he ran it one weekend last winter on a day the mercury plummeted to 10 below. “Four pulls and she ran like a champ,” he says. This entry was posted in Products and tagged Honda 35cc Lite, James Holst, Joel Nelson, Lazer Mag, Lazer Pro, Magmum, Mark Martin, Mora Ice, StrikeMaster, Tony Roach. Bookmark the permalink.